>> U.S. AND CANADA HANDS OFF IRAQ! >> NO TO NEW U.S. WAR ON IRAQ! >> U.S. AND CANADA HANDS OFF SYRIA! The U.S. government is yet again on the warpath, launching a new war on Iraq. Through over 11 years of fueling sectarian divisions during the U.S. war and occupation of Iraq, as well as the U.S. funding and arming of ISIS in Syria, the U.S. government has essentially created a new enemy and a new excuse to yet again attack Iraq. While ISIS is a serious threat to the Iraqi people, it is the Iraqi people who can confront them, not U.S. forces who with one hand are feeding ISIS and claiming to fight them with another. We already know what the U.S. military in Iraq looks like. It looks like the bombing invasion of Baghdad, infamous night raids, Abu Ghraib prison and detainee torture, destruction of infrastructure and the deaths of well over 1.8 million Iraqi people. The U.S. government claims of launching airstrikes against Iraq to protect the Iraqi people is a hollow one, given the U.S. history in Iraq as well as the U.S.-sponsored origins of ISIS. In addition to already launching more than 170 airstrikes in Iraq as part of this new war, the U.S. government is also expanding this war with plans for airstrikes on Syria. Yesterday the U.S. government announced that they will be training and arming Syrian so-called “rebels” to fight ISIS in Syria. This plan doesn’t mention how ISIS itself gained strength in Syria with over three years of U.S. funding and arming in an illegal attempt to overthrow the government of Syria, causing total chaos in Syria! The purpose of this U.S. campaign against ISIS is also to reinforce and ramp up the U.S. war against the government of Syria. As this new war drive against Iraq is gearing up, the government of Canada has added their forces to the war machine. Currently Canada has already sent at least 69 special operations forces to Iraq. 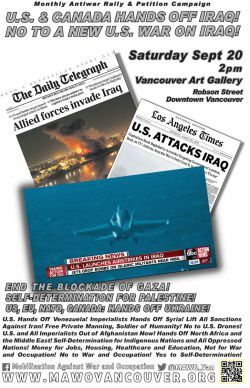 It is up to peace-loving people here in Canada and around the world to demand an end to this new war against Iraq!